With those words, the World Bank Group’s network on Financial and Private Sector Development (FPD) this week kicked off a major knowledge and learning conference on development in Mombasa, Kenya. More than 250 participants – private-sector innovators, government policymakers and development practitioners from throughout the Africa region as well as from the Bank Group’s headquarters in Washington – came together to share ideas about cutting-edge innovations in delivering services; to brainstorm with colleagues on development strategy for Africa; and to consider new tactics to help meet the practical, everyday needs of Africans. Delivering strong value for the Bank Group’s client countries was the theme of Klaus Tilmes, the network’s Acting Vice President, as the group envisioned the impending FPD transition into two new Global Practices: Trade & Competitiveness and Finance & Markets. Inclusive growth and inclusive finance – which are vital elements in achieving the Bank Group’s mission of eliminating extreme poverty and building shared prosperity – are the twin and complementary themes through which the two new practices will aim to help their clients meet the development challenge. Promoting inclusive growth and creating jobs – as engines of growth, as key areas of cooperation between the public and private sectors, and as the backbone of the Bank Group’s approach to promoting a world free of poverty – was the conference’s first-day theme. In this context, youth and female unemployment are priority issues for Kenya and for other African countries – from the perspective of equity, certainly, but also from the perspective of social cohesion. As the 15th Annual World Bank Land and Poverty conference convenes in Washington, DC, this week, it is clear that the effective governance and use of land have profound implications for many of the global challenges we face today – from managing rapid urbanization to creating jobs, stimulating investment, ensuring food security, supporting climate smart agriculture, and enhancing transparency. To contribute to this global conversation, the World Bank Group and UNCTAD have prepared a joint report, The Practice of Responsible Investment Principles in Larger-Scale Agricultural Investments, which analyzes the impact of larger scale agribusiness investments – especially on local populations. The post-conflict literature amongst practitioners (including the Bank’s WDR 2011 and the OECD’s INCAF) has increasingly focussed on the role of ‘inclusive enough’ political settlements as a precondition for political stability and economic growth. What does this mean? Can an understanding of political settlements help mould the Bank’s responses to moments of crisis in our client countries or inform our “business as usual” operations in countries where the seeds of future violence are apparent or looming? How do we recognize tenuous settlements, where grievances are likely to lead to an outbreak of, or return to, widespread conflict? One Question: What Is Your Favorite Number? We know that numbers are useful. We rely on them to analyze global economic trends, but also to count calories, create passwords, manage schedules and track our spending. Numbers give order to the chaos of our lives. And that means we can use numbers to reflect, learn, and re-discover ourselves. We’ve launched a new YouTube series called ‘My Favorite Number,’ that shows how a single digit can give us unique insight into global development and humanity. A number can have a profound effect on human lives. The broad objective of the World Bank’s India Country Partnership Strategy Report (CPS) for the period 2013-2017 is to support poverty reduction and shared prosperity in India. The Report states that between 2005 and 2010, India’s share of global GDP increased from 1.8 to 2.7% and 53 million people were lifted out of poverty. But it also states that with population growth, it has proved difficult to reduce the absolute number of poor at a rapid pace and 400 million Indians still live in poverty. Each of the seven low income states (Bihar, Chhattisgarh, Jharkhand, Madhya Pradesh, Odisha, Rajasthan; Uttar Pradesh) and seven special category states (Assam, Himachal Pradesh, Manipur, Meghalaya, Mizoram, Sikkim, Uttrakhand) have poverty rates that are higher than that of the more advanced states. The low income states, where a large majority of the poorest 200 million Indians reside, are a priority for the World Bank Country Strategy funding during 2013-2017 (estimated to be $ 5 billion annually with 60 percent lending through direct financing of state projects of which half will go to low income and special category states). India, both in the above mentioned and its advanced states (e.g. 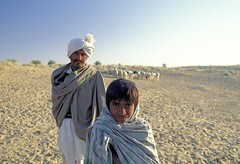 Punjab, Haryana, Kerala) is undergoing a massive rural- urban transformation- one of the largest in the 21st century. For the first time since independence, India has seen a greater absolute growth in urban population. The number of towns has increased from about 5000 in 2001 to 8,000 in 2011 and some 53 cities have a population exceeding one million. Today 30.1 percent of the population lives in urban areas and the share is expected to rise to 50% in the next 20 years (with urban India expected to generate 70% of its GDP by 2030). Though villages vastly outnumber towns in India (660,000 villages as per Census 2011), the construct of these villages is changing as the economy grows. When it comes to primary education, there are many reasons to be optimistic. Enrollment has jumped across the world, and more children are in school than ever before. In the last decade, the number of out-of-school children has fallen by half, from 102 million in 2000 to 57 million in 2011. But is showing up to school enough? According to UNESCO’s Education for All Global Monitoring Report, almost one quarter of the youth in the developing world cannot read a sentence. In countries with large youth populations, this can leave behind a crippling ‘legacy of illiteracy’. Despite almost universal primary enrollment in India – 97 percent – half of second grade students cannot read a full sentence, and almost a quarter cannot even recognize letters. Reading is a foundational skill. Children who do not learn to read in the primary grades are less likely to benefit from further schooling. Poor readers struggle to develop writing skills and absorb content in other areas. More worryingly, learning gaps hit disadvantaged populations the hardest, limiting their economic opportunities. In Bangladesh, only one in three of the poorest quartile is literate, compared to almost nine out of ten in the richest. Politicians rarely take a step without them. Presidents and Prime Ministers check them daily. Surveys and polls. They drive decision making across all sorts of organizations, corporations, governments and even palaces. Polls inform a range of strategies, whether related to how countries build support for reform, to how organizations move the needle on behavior change (think smoking, HIV, and drunk driving), to how companies choose the colors of a box of cereal and decide on the jingo that is intended to sell that cereal (crafted specifically to never leave your memory)!